Provide comfort for the family of Agnes Shepstone with a meaningful gesture of sympathy. AGNES ARDYCE “BLINKY” SHEPSTONE was born January 15, 1935 at the family home in Randall Township, Kenosha, Wisconsin, to Oliver William John and Cora Mae (née Hudson) Shepstone. Blinky passed away surrounded by her loving family at her daughter Lisa’s home on Thursday, March 21, 2019. Blinky was preceded in death by her son, Steven T. Davison; her parents, Oliver and Cora Shepstone; and her three brothers; Clayton M. Shepstone, Sheldon O. Shepstone, and Glenn W. “Benny” S Shepstone. She is survived by her son, Gerry S. Davison; her daughter, Shelly R. Davison (Tihomir “Ratko” Radanović); and daughter, Lisa Shepstone Stroup (Ronald W. Stroup). 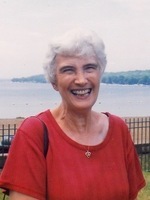 Her Grandchildren are Jordan M. Davison; Samuel R. Davison; Madison M. Stroup, and Iris A. Stroup. Blinky’s surviving siblings are Audrey D. Miller (Walter), and Judy A. Palma (Joel), as well as numerous cousins, nieces and nephews, and friends. A Celebration of Blinky’s Life will be held on Friday, March 29, 2019 at Steinke-Lazarczyk Family Funeral (515 Center Street, Lake Geneva, WI) from 4:00 PM to 7:00 PM. The Funeral service will be on Saturday, March 30, 2019 at the Funeral Home at 10:00 AM, Pastor Cathi Manthei will officiate. Internment will occur directly following the Funeral Service at the Mound Prairie Cemetery in Twin Lakes, Randall Township, Wisconsin, on the Shepstone Family Plot. The Davison, Radanović, and Shepstone-Stroup Families would like to extend their heartfelt appreciation to the Cleveland Clinic Hospice Staff for the loving care and support of Blinky & family in her final days, and as she passed peacefully into her Lord’s arms. In lieu of flowers, the family requests donations be made in Blinky’s memory to the Alzheimer’s Foundation. For online condolences, please visit www.slfhlg.net. Steinke-Lazarczyk Family Funeral Home and Cremation Services of Lake Geneva, WI is proudly serving the family. To send flowers in memory of Agnes Ardyce "Blinky" Shepstone, please visit our Heartfelt Sympathies Store.